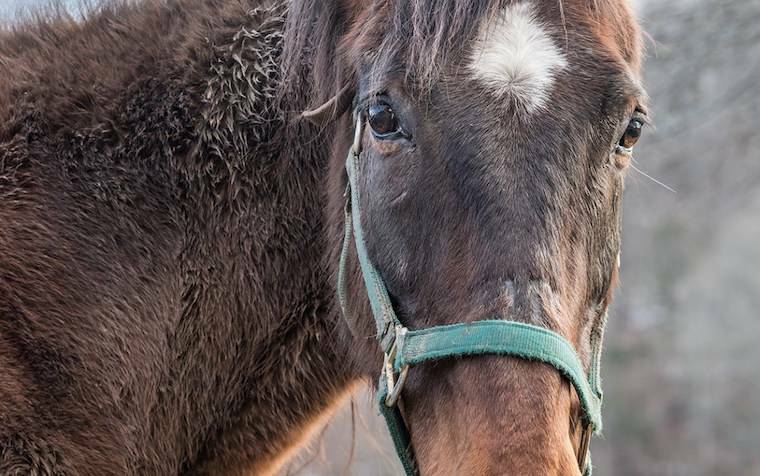 Pliers, a 35-year-old horse rescued from hopelessness with his mother 15 months earlier, was down in his paddock one morning, pinned awkwardly against the fence. This dangerous position is referred to as being “cast,” and describes when a horse has either laid down or rolled so close to a wall or fence that he can’t get his footing to stand. Pliers had been down for hours. He was as still as a stone. I’d be lying if I said that our animal care crew was cruising through winter unscathed, happily ignoring every insult that the season hurls their way. They’re not. Rather, worn weary by a host of factors including the season itself, they’re struggling. On our worst days, when volunteers are no-shows or none are scheduled, just getting through the day is an uphill battle. Yet somehow, they run on empty and still smile…at least most of the time. It was this same team that found Pliers, a 35-year-old horse rescued from hopelessness with his mother 15 months earlier, down in his paddock one morning, pinned awkwardly against the fence. This dangerous position is referred to as being “cast,” and describes when a horse has either laid down or rolled so close to a wall or fence that he can’t get his footing to stand. Judging by his appearance (described by Health Care Manager Kellie Myers as “beyond the shivering stage”), Pliers had been down for hours. He was as still as a stone. Dr. Andrea Sotela of Rhinebeck Equine was called, and so was Kelly Mullins, Animal Care Director, who rushed in on her day off. My phone rang at 8:15. I wasn’t. I was 90 minutes away. By the time I arrived, the barn was humming as staff and volunteers who’d “dropped everything” to come in on their day off cleaned stalls, filled hayracks and water buckets, washed dishes. While the caretakers tried to save one precious life, the backup team managed the care of 300 others. I hurried down “equine alley” and from a distance saw seven people—two vets and five staff— clustered around a prone horse: Kellie Myers, Kelly Mullins, Kate, Brooke and Rich, our buildings and grounds guy. Rich was here in case we needed the tractor to lift Pliers, or more likely, to bury him. I climbed over the gate. Another caretaker, Matt, was holding Ashley, Pliers’ mother, in the run-in, away from her son. Still neurotically attached to him despite remarkable progress, she’d been sedated twice. Pliers was in the middle of the paddock, covered with a thermal blanket and additional ones. Caretaker Kate, encrusted in mud, held a bag of IV fluids, the umpteenth Pliers had received that morning. Dr. Sotela ran down the scenario: the team had rolled Pliers over and away from the fence. They got him up. He fell. They got him up again. He fell again. He was too depleted, and the paddock, muddy from the rapid snow melt, was working against him. Dr. Sotela rattled off his body temperature (5 degrees below normal), a description of his gut sounds, the medications he’d received, the liters of fluids. And then the plan of action: more fluids, keep him settled as his body temperature rose and he recovered strength, and then three more attempts to help him stand. The first would be manual—just human strength and the will and reserves of a very old, very tired horse. If that failed, they’d attempt to lift him with heavy straps shoved under his belly. The final effort would utilize the tractor and tow straps to lift him into the air then gently lower him down, supporting him as he tried to bear his own weight. “Mullins, are you on board with this?” I asked. Sanctuary work demands that we be damned good at assessing when it’s time to let an animal go. To prolong the fight, and consequently the suffering, of an old, worn out animal is no more ethically justifiable than doing the same thing to one’s own grandparent. One needs the wisdom to know not only how possible a good outcome is, but also what the animal would want, if he could speak. And then one needs the courage to honor that choice. So we give these gut-wrenching moments our very best, but once we’ve done so, and we see that the fight in a precious life is gone, then our final act of love is to let go. I looked at Pliers’ face. I watched his labored breathing. I thought about his age, and about the years of neglect and extent to which they’d taken their toll. And I felt certain that these were Pliers’ final moments. But I hadn’t been there for the previous three hours to see what had led up to right now. More importantly, I trusted the wisdom and the guts of our team to know when to say, “Enough.” So while it was all I could do not to play the heavy and say, “We’re done here guys,” I didn’t. Pliers, and the team, would continue to have their shot at the unlikeliest of happy endings. I returned to the main barn, our hub. In the feed room, I organized the cleaning list: the sheep needed to be stripped. The piglets, ditto. Mario and Audrey’s barn. The goats. The list grew. I transferred it to the cleaning board in the aisle, assigned staff to various tasks, then picked up my own tools—pitchfork, shovel, rake—and loaded them into the “Daisy Duke,” our fluorescent yellow and orange work truck. I headed to one of the smaller pig barns, climbed the gate, and began cleaning. Shovel, lift, toss. Shovel, lift, toss. The barn emptied, the Daisy Duke filled, as Mario the pig kept me company. “Are you having a good day?” I asked him. “Umph,” he replied. “Umph. Umph.” As I continued cleaning, he continued chatting. I’d only been working for 45 minutes, but needed water, so I walked into the barn to discover Kelsey, our newest caretaker, putting way too many shavings in a stall. “Hey, love,” I said. “You can be a little less generous,” I suggested. Or something like that. My heart in my throat, I high-tailed it down equine alley to see ancient, blind Ashley being led from the pasture toward the main barn. And behind her, caked in mud from the tip of his ears to the bottom of his tail, came Pliers, steadied by Kate, the filthiest, happiest human I’d ever seen, taking one slow, tentative step toward the main barn. He was shaky, but very much alive. Pliers hadn’t had the energy to stand with human help, so in the end, tow straps and the long arms of the tractor bucket lifted him straight into the air and stood him on his feet. Limp when Rich hoisted him, Pliers had the good sense to lean against the tractor for support when his feet touched the ground. There, still supported by the tow straps, he eagerly accepted hot mash and hay. Minutes passed as the crew stood, surrounding him, surely as exhausted as our old boy. Eventually his shaking legs steadied. Once that happened, they removed the support straps, and then his walk to the barn began: a few steps. Rest. A few more. Rest again. His ordeal, it seemed, was over. “It’s a miracle,” was the whispered refrain, because frankly, not one of us expected this ending. But a “miracle” is not what unfolded today in a muddy paddock at Catskill Animal Sanctuary. Instead, the know-how of a good vet, the guts, grace, and grit of a bone-weary animal care team, and the trust of a horse not quite ready pack it in coalesced on a breathtaking morning to allow that old boy to live to see another day. Come to think of it, maybe that is a miracle. Tonight, Pliers is snoozing in a warm barn stall, his body and psyche recovering from as much of a near-death situation as I’ve witnessed in 17 years. Ashley is in the stall next to him. A huge window in the dividing wall allows them to touch whenever they need to. Down the aisle, Sister Mary Frances, our free-ranging potbelly pig, snores under a 3-foot mound of straw and blankets. Hermione the goat calls for me, and I head down the aisle to say hello. For now, all is well. The crew that agreed to accept Ashley and Pliers 15 months ago to prevent them from being shot by their owner will begin anew tomorrow morning. An abundance of challenges will slow their day: frozen locks, frozen water, dangerous patches of ice. But they will show up, on time and smiling, to give their very best, no matter what it takes. Because that’s what they do.